I produce art because I feel the need to release emotions, learn to understand my surroundings and ultimately feel the connection I have with the world around me. It is with this expression that I create visual forms of art, using glass and mixed media to engage viewers through use of their senses. When I was 21 I discovered the process of glass blowing. 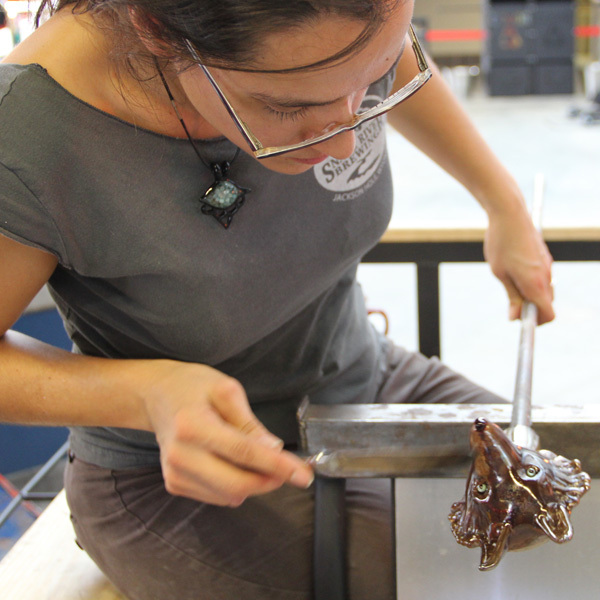 Watching the molten glass dancing around the studio was like nothing I had ever seen. I knew then that I wanted to work with this material. After practicing the technique of glass working for five years I began to develop greater meaning into my work. Sometimes I create art about our natural past, while other times I focus on current issues that are pulling us away from that purity. My work raises the awareness that humans are connected to each other and the world around them. We must work with nature in order to survive because we are nature. At the same time we have these intelligent minds that drive us to constantly enhance technology. When technology and nature merge on a constant basis, where a symbiotic relationship is achieved we can truly be at peace.